Habit: Annual, generally slender; +- gray +- minutely strigose. Stem: prostrate to +- erect, 2.5--45 cm. Leaf: 0.8--7.5 cm; leaflets 9--17, 2--14 mm, linear to oblanceolate, tips notched. Inflorescence: head-like; flowers 5--30, erect or ascending. Flower: < 9 mm; calyx hairs +- mixed black, white; petals +- white, purple-tinged. 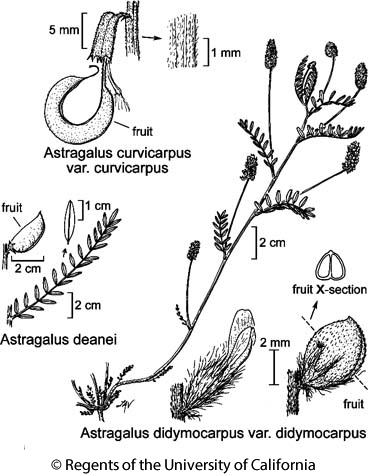 Fruit: ascending, +- included in calyx, 2--4 mm, +- 2 mm wide, +- spheric, 2-lobed in ×-section, +- minutely strigose (glabrous), coarsely wrinkled, drying stiff-papery; chambers 2. Stem: +- erect, 25--45 cm; herbage +- green, sparsely +- strigose. Inflorescence: flowers 5--25. Flower: calyx hairs mostly black, lobes generally 0.8--1.5 mm; banner 2.8--6.1 mm, keel 2.4--4.5 mm, abruptly curved, tip bluntly pointed. Chromosomes: 2n=24. Citation for this treatment: Martin F. Wojciechowski & Richard Spellenberg 2012, Astragalus didymocarpus var. didymocarpus, in Jepson Flora Project (eds.) Jepson eFlora, http://ucjeps.berkeley.edu/eflora/eflora_display.php?tid=54711, accessed on April 24, 2019.
c&s SNF, Teh, GV, CW, SW, DMoj; Markers link to CCH specimen records. Yellow markers indicate records that may provide evidence for eFlora range revision or may have georeferencing or identification issues. Purple markers indicate specimens collected from a garden, greenhouse, or other non-wild location.